Would you be willing to stand up in a plane flight for a lower price? 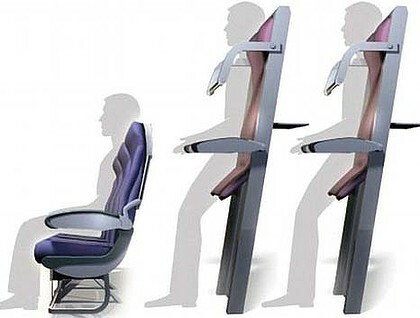 View Poll Results: Would you choose a 'vertical seat' for a short-haul flight at a discount price? Ryanair hopes so. They're planning to trial standing-up seats for a lower price than proper ones. Australians flying on discount airlines may one day substitute seating for savings, following plans by one European carrier to allow passengers to fly standing up. Ryanair chief executive Michael O'Leary will announce a proposal today for "vertical seats", which will provide standing-room spots on short-haul flights for a cost of about £5 ($A8.90). Asked today whether it would consider a similar proposal, Tiger Airways said selling cheap fares meant continually having to innovate and evolve to reduce the cost base. "Tiger Airways doesn't rule anything out," the budget carrier's Australia commercial director, Steve Burns, said. Mr Burns said while there were no immediate plans for vertical seating, "we continue to look at ways of making our operation more efficient so we can offer even lower fares than we do now". "Everything we do is about offering the lowest possible fare then allowing our customers to choose what, if any, extras they wish to pay for," he said. Mr O'Leary told ITV's How To Beat the Budget Airlines program Ryanair would convert the back 10 rows of seats into standing area. "We are aiming at starting safety testing in about 12 months with a view to going into service with the new arrangements in about 18 months to two years' time," a spokesman told The Guardian. "We think this would work well on our winter services so would hope to eventually introduce it for a winter timetable." However, the newspaper reported that safety officials at the European Aviation Safety Agency said the plan was unlikely to pass the regulator's requirements. Aircraft manufacturer Boeing has already rejected Ryanair's controversial plans once, but the airline says it has re-entered talks over its proposals. Ryanair has dismissed claims it is only seeking publicity and is not serious about the proposals. The airline said the same claims were made two years ago when it announced it would remove its check-in desks from airports. It removed the last of its check-in desks in October last year. Ryanair has also repeatedly raised the possibility of charging passengers to use the toilets on flights lasting less than an hour. Jetstar and Virgin Blue have been contacted for comment. Re: Would you be willing to stand up in a plane flight for a lower price? Depends on how long it was. While to many people this may seem nuts, it happens in public transportation all the time. Buses, trains, subway-trains and trams all overfill and force people to stand up during busy periods. I'd say an hour at the max though. Not sure about anything more. Well standing up on a train for an hour isn't fun, and I doubt standing in an airplane would be any more so. And worst of all they don't give you discounts on trains or buses if you have to stand! Oh ideally, yes you'd wanna be sitting down. I don't mind the idea of having a cheaper option but it seems a bit...slumlord of the airlines especially since these haven't been available previously. Never. ever. I'll drive where I'm going and then take a boat before I stand for a five hour (or longer) flight. Perhaps they should look into some sort of cot arrangement, alla Fifth Element? Being packed like a sardine on an airplane for 4+ hours... PASS! It would have to be a hell of a discount, or sitting down would have to be ridiculously expensive. No thanks. Well they said it was around 5 pounds. Which, if I desperately needed to get on that plane and all the regular seats were full, i'd pay it no problem. I like the option - just once this doesn't become some kind of sub-standard for airlines to save space. Ryanair chief executive Michael O'Leary will announce a proposal today for "vertical seats", which will provide standing-room spots on short-haul flights for a cost of about £5 ($A8.90)."